She wants to have lunch with you and your brothers at her Father’s house tomorrow. Tomorrow is the Feast of the Assumption, a holy day of obligation. St. Louis’ noon Mass offers a convenient way to fulfill the obligation. 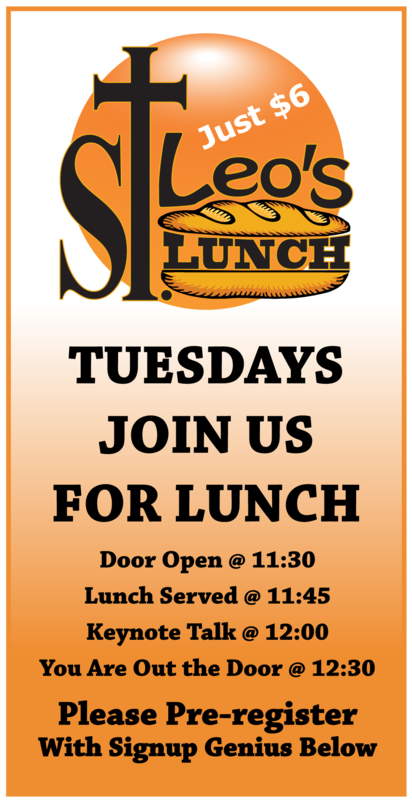 To make it even more convenient, we are cancelling St. Leo’s lunch. IMAGINE 75-100 men literally “in Communion” with each other as members of the body of Christ, sharing the Eucharist as our noonday meal, celebrating the solidarity that comes from Christ within us. It will be a dramatic example of authentic manhood. To honor the way Mary let God interrupt her life by joyfully allowing Him to interrupt our plans. To live out the Consecration of our Diocese to Mary, thus fulfilling the desire of Bishop Holley and Fr. Jolly to allow Mary into our lives. To model authentic manhood by showing our sacrifice as a way to love and honor Jesus and His mother; to show with our actions what our priorities are. Will you walk the walk?